It’s getting chilly and I’m so in the mood for creamy steamy oatmeal. I love mine with brown sugar (or maple syrup), raisins and lots of cinnamon. 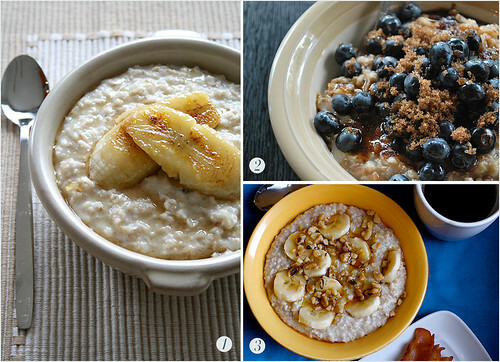 Here are a ton of oatmeal recipes that sound just perfect for a cold morning breakfast. Oh my goodness, I have to try some of those oatmeal recipes! And here I was just buying the apple cinnamon flavor and being lazy. Marissa, those packages are super yummy but they don’t compare with real stove top cooked oats. I’m lazy too though most of the time! Don’t tell anyone. ohmygosh, i was just thinking about how i want to get up early tomorrow morning to make oatmeal for breakfast and here you are offering all sorts of wonderful inspiration! obviously, we are on the same libra wavelength. I’ve been making smoothies in the morning for me and Dave and they’re yummy but so cold. It’s really time to switch over to sweet delicious oatmeal. I’ve gotten microwave stuff but it does not compare to real stove top cooked oats. On maternity leave this fall/winter I really want to try some of these recipes.